Using the right amount of water is key to a well-executed core drilling. You may have heard of core drilling and all the cool things it’s used for, or seen the intricate drills used for this job. Plumbing, HVAC, cabling, material quality analysis, and even installation of recessed lighting rely on core drilling done with the right technique. 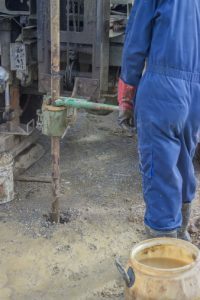 A common question among people that do core drilling is, “How much water should I use?” This is an important question for anyone operating a core drill, or anyone enlisting the services of a core drilling company. Keep reading for a quick rundown of core drilling operation. As you know, diamonds are a vital part of the entire process. A perfect 10 on the Mohs hardness scale, diamonds help cut through even the hardest surfaces. As the diamonds grind away at the concrete, it throws out dust and debris. Water is introduced to do two different things. First, since core drilling in concrete creates a lot of friction, the drill bit needs to be cooled. Second, the water collects all of the dust and debris getting thrown around and forms a mixture. This mixture helps clear away the dust and give the drill bit a fresh surface to grind. While you might think that it’s better to use more water to keep the bit cool and wash away debris, it’s generally accepted that less water is better. A common rule of thumb is to add water until the mixture looks like coffee with a lot of cream in it. This will keep the bit cooler than clean water can, and exposes the maximum amount of diamonds to contact with the concrete. This entry was posted on Thursday, July 7th, 2016	at 2:28 pm	. Both comments and pings are currently closed.